ToXSL Technologies gives Industrial Training in Software Testing with Live Projects for Mtech, Btech, MCA, and BCA. Software Quality Testing is absolutely essential in a majority of corporate setups. 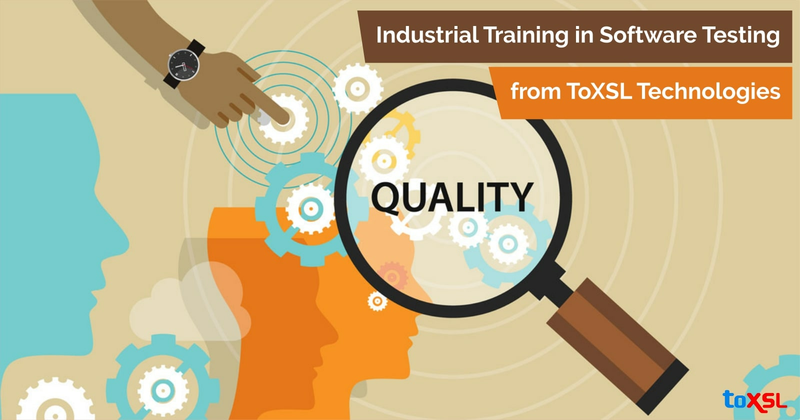 ToXSL's project-based Industrial Training in Software Testing builds an individual's expertise in testing activities that contains finding mistakes and bugs in a software. Our training is project-based where trainees are tasked with real-time assignments that help them see how software testing actually happens in the corporate environment. We are recognized as the topmost institute that gives Industrial Training in Software Testing in Chandigarh. The job of a software tester requires understanding what the user expects from a software product and evaluating the software being created to check whether it satisfies those expectations. These expectations relate not only to the structures the software should have, but also other attributes, for example, usability, execution, and security. Moreover, the software tester needs to affirm that regardless of whether users commit mistakes while using the software and enter incorrect data, the software can deal with those situations. Software testing jobs demand that the testers get as many numbers of flaws as possible with the goal that end-users are not affected. In the present situation, the software tester between you and an unusable product. Most organizations today have a software testing role with conforming development roles. Software testers' duties, at numerous dimensions, including guessing the amount of work, writing test cases, executing experiments, creating defect reports, testing the fixed defects, working with developers to help distinguish and fix bugs, etc. After Software Testing Industrial Training, learning the interview skills indeed becomes obligatory. Alongside Software Testing classes, we conduct sessions for personality development, spoken English, and presentation. Our industrial training is designed according to the latest IT market. We offer the best training and placement in Chandigarh with well-defined training modules and course sessions. We help our trainees in project training, live project preparation, interview preparation, and job placement support. We are equipped with smart labs, real test equipment, and highly skilled trainers. We have discussion zone areas in labs to enrich self-study and group discussions. We also offer free of cost personality development sessions including spoken English, group discussions, mock interviews, and presentation skills. Our trainers are fully up-to-date as they are working on real-world industry applications. Our trainers have received awards and recognition from countless recognized IT organizations. Our trainers are certified professionals with years of experience. ToXSL Technologies is the most credible Institute for Industrial Training in Software Testing. We try to change a student into a professional. Every one of our trainers is highly skilled in software testing. We have been serving to the students for a long time now. So don't hold up any longer enroll with ToXSL Technologies today.